I often think it's rather sad that my kids won't grow up eating seafood or participate in actives around the ocean like I did. We do live in Seattle, surrounded by water and marine activities, but the water is too cold to dip yourself into and the regulations are so tight when we hunt food from the sea. When I first heard about getting a license to dig clams, I was like "umm...uennngm....... what? why?" After reviewing the reasons like the native tribes' rights and over-harvesting, I do understand and agree with its strict regulations. Maybe my hometown could use some sort of a guideline like don't dump the dirty water into the stream where people dig clams to eat. Back to the baked clams. I don't often make this, but I do order something similar whenever I see it on the menu at the restaurants. I've had more bad ones than good ones, even though it's such a simple dish. 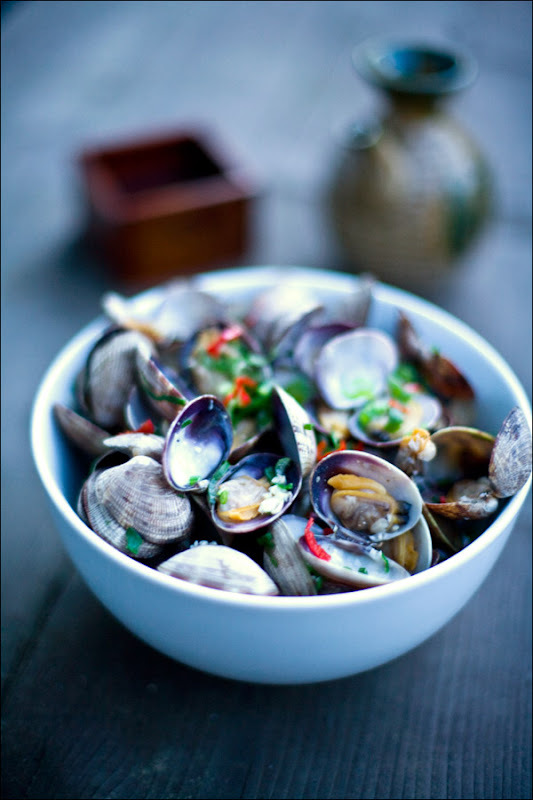 I think when I get bad ones, the clams or mussels are not as fresh as they should be and they are over-seasoned and cooked until they only taste like rubbers with rich sauce. This reminds me also that a ridiculous looking clam dish I had. The huge plate came with 5 tiny pieces of fresh clams on ice. I thought it was a joke or mistake at first, but I laughed and then got mad when I realized that I had to pay too much for it. I didn't know that it was such a silly dish. I suppose it seems to work better with oysters since they are typically bigger. But I can't stop wondering who came up with this silly dish and why many restaurants have it on the menu? For me, it wasn't worth it at all. Learning from my own mistakes, this dish is a great one to make at home. Easy and tasty. Heat up a pan and put butter and garlic. Add clam and then salt and pepper. Add sake into the pan and cover to bake it for 3 minutes. Pour it into a bowl and sprinkle chopped scallions and chili.